Since some of my readers have an interest level in the San Francisco food scene that is marginal at best, i am instituting with this post a new policy. All food posts will henceforth be clearly identified as such so that they can be easily avoided by those incapable of appreciating them. First, an overdue note on Pläj, located at 333 Fulton and inside the Inn at the Opera. The owner is Swedish and bills the place as “San Francico’s only Scandinavian restaurant,” which i assume is true now, but i can remember that when i moved here in the seventies there were two Scandinavian restaurants in the Castro, both run by Scandinavian immigrants. The Norse Cove on Castro (now The Cove) and the Scandinavian Deli on Market. Both restaurants marched steadfastly to their own owner/drummer. Ernie at the Scandinavian Deli cooked and served large portions of good plain food at lunch only to a mixed clientele of working men and hungry young gays. The Norse Cove was operated by a Norse lady on an honor system. You placed your order with her, grabbed your drinks and chips, and sat down at the long communal tables. They brought your order to your table when it was ready, and after the meal you went back to the lady, told her what you’d eaten, and she tallied your bill. It was such a thrill to be trusted that it was utterly unthinkable to cheat her, and in retrospect it was also probably impossible since she was monitoring the entire operation and could doubtless remember what you’d ordered and see what drinks you’d taken from the cooler. What a wonderful atmosphere that place had. But yes, i was writing about Pläj. My friends Ruth and Pam took me there, and i was just blown away. This restaurant is one of the finest restaurants i’ve patronized in the past decade, right up there with One Market and the Zuni. Appearance is not high in my restaurant priorities, but the place is just lovely. The staff are all relaxed, charming, and informed. And the food? Well, the sample menu online includes the line, “Our plates are sized purposefully for you to enjoy several dishes,” which is a very polite way of saying that the portions are tiny, but oh, are they ever delicious. Every bite is a treasure. You can’t leave a Swedish place without having the Swedish meatballs, and they were excellent. We also had the charcuterie plate, paper thin slices of superb Swedish salumi, the mouth-melting gravlox, and a couple of dishes not on the online sample menu. A superb dining experience. Go. But not when it’s your turn to pay. The only other place i’ve discovered recently is the new gyros place at the corner of 18th and Castro that replaced a new Korean place that failed to gain traction. I stopped at the gyros place for lunch the other day and for my first visit had the traditional gyros stuffed into pita. Although it wasn’t as exciting as i’d hoped, it was definitely good enough to have again, and the menu has a number of other middle-eastern dishes that i want to try. The big food news is that it’s stone fruit season in California, and i’ve been preserving like mad. So far a cherry chutney and jams of both apricot and nectarine, both of which i brightened up with a dab of New Mexico chile powder. See the 2014 Production Report. 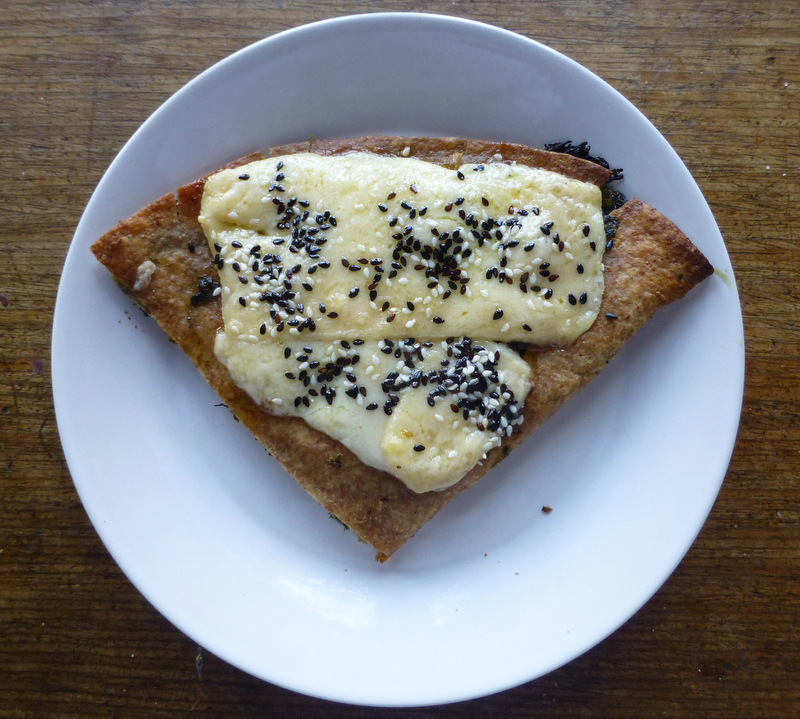 Looked around for a food pic and found this one of the whole wheat spinach bolani from East West Afghan foods surmounted with some Waag Gouda and mixed sesame seeds and popped into the toaster oven until perfect.